Because each heritage, each legacy, is made up of a unique collection of materials, there is no one set price for organization or preservation. However, TimeSorters understands that you might want to know the costs associated with preserving your legacy BEFORE committing to having the work done. So we offer a FREE one-hour consultation to view the items and discuss your needs. Your Heritage Preservation Specialist will then provide a written quote before work is begun. You will know exactly what the cost of organizing and preserving your items will be. Our primary goal is to help you preserve your history and so our quotes contain detailed selections of service options, from basic needs such as organizing/refoldering and boxing to more complex processes including digital restoration, customized storage containers, professional framing and shadow boxing allowing you to choose the best preservation option at a price you can afford. 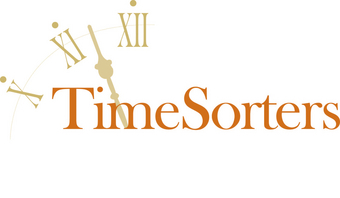 Also TimeSorters' fees are based on hourly rates. There are NO HIDDEN COSTS or FEES and all standard materials* are included in the price quoted. Your treasured family history is disappearing before your eyes - you can't afford to wait to preserve it. Let TimeSorters show you how affordable and easy it is to preserve your place in history! * "Standard Materials" include any items, such as file folders, protective sheets,storage boxes, foam, etc. that are used in any preservation storage project. Special sized, or display, boxes that are not used in every-day storage of materials will be priced for the client separately and BEFORE ordering.